European military presence in Asia – Who Dares? Well as for Japan, we know that DARING will be making a call. 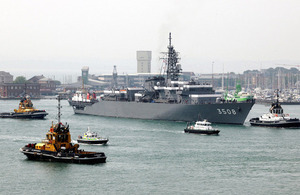 Japan’s Ambassador to the UK Keiichi Hayashi (another Yamaguchi/Choshu man) mentioned in a speech he gave at Portsmouth at a reception on board JS Kashima on July 23 that HMS Daring will indeed call in Tokyo in late Autumn with the UK’s top Naval Officer First Sea Lord Admiral Zambellas in attendance. Thank you for the very kind plug for my blog! 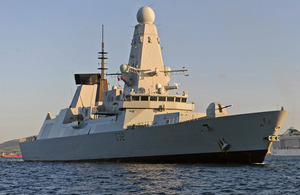 The news that DARING will be going to Japan is extremely interesting, and highlights a growing level of co-operation between the two countries – its often forgotten that the UK and Japanese ground forces had some links in Iraq, and there has been closer maritime co-operation for some time too. It will be interesting to see how things evolve in the post HERRICK environment, although I am not certain of a UK defence shift to Asia, more a gentle meander into the region on a more frequent basis than before. Sir Humph, I mostly concur with your analysis (‘gentle meander on a more frequent basis than before’). However, I intend to follow events more closely on a sibling blog I will begin soon devoted to the UK-Japan relationship on Defence & Security. It is partly because I am wary of unbalancing this blog with too much focus on the UK and Japan, but partly because of the salience of that link as compared to that between other nations in the Euro-Asia field. And partly because I am a Brit, and I want to check my bias without eliminating it. Thanks for the link. What I find interesting also is that we don’t any longer have ‘Alliance’ relationships like the 1902 Anglo-Japan alliance, but we do increasingly have these kind of special relationships. The recent agreements between UK and Japan do not together add up to an alliance like NATO or the US-Japan alliance, but they are somewhere between normal relations and collective security agreements. Their structure says something interesting about the nature of security relations and IR today compared with the past, and I want to understand that better. In this case, it also tells us something interesting about how a post-Imperial, post Cold-War, Post GWOT-fixated UK security & defence identity and strategy is forming.